Contemporary Art from Tehran. Exhibition in Athens, Greece, curated by the artist Alexandros Georgiou. Lion under the Rainbow is an exhibition of artworks by Iranian artists who live and work in Tehran, curated by the artist Alexandros Georgiou. The idea for this show arose in 2005, during an art project that took him across Turkey, Iran and Pakistan, travelling by train and bus. Of the four and a half months of this journey, he spent half of the time in Iran, mainly in Tehran, where, as he writes, he could dismantle the distorted ideas about the country he had from the media, falling in love with the refinement and sophistication of the Iranians he met. 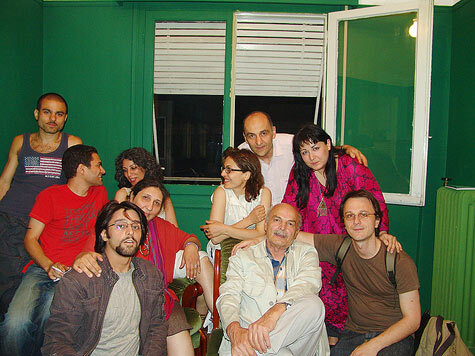 With this exhibition in mind, he returned to Tehran in the summer of 2007 to research contemporary art production, starting off at the Museum of Contemporary Art, where he was granted access to the archives. He spent six weeks visiting four to five studios daily to see works by artists he had chosen from the museum archives. And they introduced him to other interesting artist friends. The final selection includes 19 artists from different generations working in different media. Their works reveal a "sensitivity and mental freedom expressed in refined manners and, frequently, a sharp sense of humour." Their approaches "go beyond realism and carry a fantastical element bringing forward an unexpectedly different perspective." Lion under the Rainbow, is borrowed from a painting by Vahid Sharifan. Simultaneously poetic and political, it is meant as a challenge to what many people expect to see and hear when Iran is mentioned. In his statement, Alexandros Georgiou points out that the selection of the works is personal, hoping that "when seen together, they offer a vision of truth, courage and hope." The exhibition is organized by D.ART as a parallel event of ART ATHINA 2008. With statements by the artists in English, Farsi, and Greek.